So, how can a songwriter or musician create an environment where they can confidently expect their song will be listened to and heard? Songwriters and musicians must create a sense of need and necessity in their potential listeners and fans because this leads directly to the all-important feeling of anticipation in listeners and fans for an upcoming song release. No matter what, a sense of anticipation is always… always what motivates and drives a person to want to experience or own something. So, from a musician or songwriter’s point of view, being able to turn on this sense of anticipation in people’s minds about a song release, is when a musician can expect their songs to get heard. We used one of the techniques in The Musician’s Blueprint To Getting Heard and we were able to give this song real momentum – even before the song was uploaded. So, by the time the song was live online, we fully expected a lot of listeners. And that’s exactly what happened. 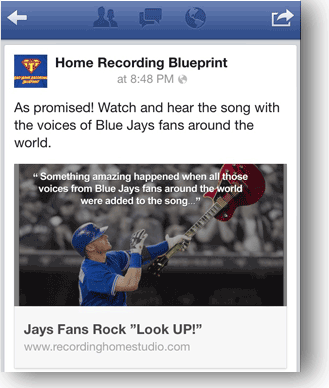 Let’s look at the 4 steps we took to promote this song and how an audience was created for it. This song is a pop/rock song and happened to use baseball as a metaphor for teamwork and succeeding in life. So, rather than blindly uploading the song and hoping the right audience of people would somehow find it, we decided to creatively pre-target music fans who also like baseball: Creatively pre-target? Yes. We set up something kind of unique and invited them to be part of the actual creation of the song’s recording. The goal for this song was to think of a creative idea to get listeners anticipating it and interested in hearing it – before it was even released. The creative idea we came up with to get listeners involved in this song very early in its life, was to post an online invitation on Facebook, for people to record themselves on their mobile phones singing, shouting or chanting the chorus lyrics of the song. We promised that all the voices that came in would be added to the song’s final mix. STEP 2: Once you have pre-targeted the right audience for your song and creatively sparked their interest for your upcoming song release, make sure to keep this audience interested by feeding their sense of anticipation by posting updates throughout the project – leading all the way up to the big day (the release). STEP 3: Once the song is released, make it easy (and clear) for the audience to know where to click to go listen to the song. STEP 4: Once the audience gets to the song’s listening/viewing page, make a clear path for them to own/buy the song. – from creating an interested and motivated audience for the song, all the way to the song’s release and marketing the song for sale online. The Musician’s Blueprint Guides: From song creation to song promotion and release. What becomes very clear with a totally indie song and promotion like this one, is that the whole project – from the song’s creation (recording) to its journey to getting heard – was guided entirely by 2 simple guides from The Musician’s Blueprint Series. 1. 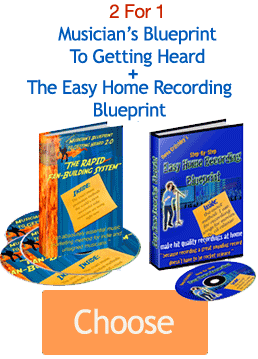 The first was The Easy Home Recording Blueprint Method – which was followed step by step to make a pro-quality recording and mix of this song – And how to do that using a very simple and incredibly cheap home recording setup. 2. To get this song heard by so many people, we simply followed The Musician’s Blueprint To Getting Heard step by step (especially the section in this Blueprint called, The Rapid Fan-Building Method). The Blueprint showed how to build a large audience of listeners and fans for this song, and how to make this audience active, interested and motivated to experience the song the minute it was uploaded and released. When following The Musician’s Blueprint Guides, it’s always very cool to simply put the pieces in place and watch everything happen.